Higher education is an industry that remains mired in paperwork. Bright, eager students – digital-natives in their personal lives – find themselves forced to transport pieces of paper between administrative offices in order to set, adjust and complete their path to graduation. Of course, all of this documentation exists to keep those students, faculty and staff on the same page as they work together to achieve learning goals. But academic institutions should prepare students for life in our modern world. This means using modern technology. Paper documentation and manual processes cannot keep pace with the digital world. That was the feeling for University of South Florida’s IT leadership as they started to take a fresh look at their options. USF’s College of Public Health (COPH) was the first organization to try a new approach. As the first college of public health in Florida, USF COPH has latched on to the overarching USF goal to prepare students for the increasingly globalized world they will live and work in. The institution prides itself on creating positive experiences for its students, and noticed deficiencies in how students and their Academic Advisors were charting and managing each individual course of study. The process was overly-complex. Meetings had to be arranged in-person at various offices. When those meetings took place, paper forms were filled out. Students then carried those forms to other offices for processing. And as a course of study evolved, this cycle happened over and over again. Along the way, forms were misfiled, data was lost, decisions and approvals were slow. The college recognized that there were common components of these curriculum management processes that could be brought together, streamlined, modernized and mobilized. A great and worthy goal – but a long and hard road to code into a software application. When USF IT found Appian’s low-code, natively mobile application platform, they knew they had found their solution. A digital transformation strategy is helping USF COPH create a better end-user experience. 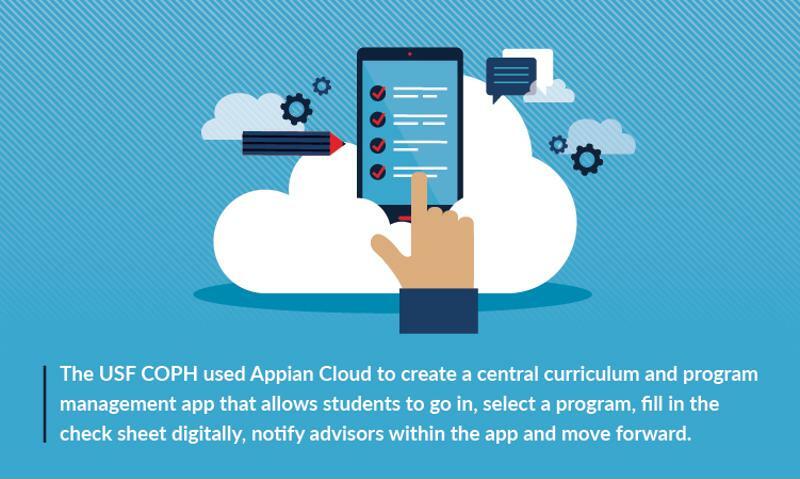 The USF COPH used Appian Cloud to create a central curriculum and program management app that allows students to go in, select a program, fill in the check sheet digitally, notify advisors within the app and move forward. Advisors can approve, provide comments and feedback and escalate approvals in the app. The app eliminated paper and put everything needed on a student’s mobile device. All told, Appian reduced the entire process from a few weeks to just a couple of days. And the app took less than a month to build and deploy. Using a low-code approach – where the application is drawn, not coded – means changing the app over time is just as fast and easy. Changes can be made at customer speed, allowing the institution to show users what is changing rather than tell them about what may be possible. Imagine being a student and going to your advisor for a half-hour consulting session. With traditional paper-based products, most of that time is going to be spent going through the files detailing the course program, making sure everything is filled out correctly, looking up details on prerequisites in a separate course catalog and taking care of similar clerical work. Digitizing these options puts the relevant data directly in the hands of students and their advisors. When all of the course selections and requirements are right on a screen, immediately visible and with details available within the app, students and advisors spend less time navigating the clerical end of establishing pathways through the academic program. This gives them more time actually discussing goals and figuring out if the selected courses are the best options. Essentially, going digital allows students and advisors to have more powerful interactions and creates a greater connectedness between faculty, students and administrators because everybody gets immediate access to the information they need. USF COPH achieved all of this with Appian, The Digital Transformation Platform™, and it was just the start. USF now has a full enterprise-wide Appian program called Archivum, a program of change management across the entire USF system. Using Appian, USF automated 8 major business functions in just 17 months. USF also has a vision to use The Appian Platform as the central hub of an Internet of Things future where applications automatically give University staff more and better data, letting them kick off processes more quickly, or even enabling “smart processes” that initiate themselves as needed. Preparing students for a digital world means offering digital student services, and USF is continuing to work toward that goal.